1. What could be the reason for getting error message FCO_COPA006 after upgrading to SFIN? In SAP Accounting, for using the new CO-PA features for SAP Business Suite powered by SAP HANA, it is a prerequisite to activate the account-based CO-PA in your operating concern. Costing-based CO-PA or both in parallel can be used further. Do not forget activating the account-based variant as otherwise an error message FCO_COPA 006 is received as a reminder. On tab "Data structures" flag "Account-based" should be set in the operating concern maintenance (transaction KEA0). The error message should not be there once this flag is set. If account-based CO-PA is not required to be used, and the costing-based variant on the other hand, this error message in customizing can be switched off as in the long text of message FCO_COPA 006, it has been described. Report FCO_ADD_COPA_FIELD_TO_ACDOCA should run without problems after either of the two actions is performed. Generating the CO-PA characteristics of your operating concern into the new G/L line item table to activate account-based CO-PA is the purpose of this report. 2. How can Q1 changes be transported to production? Maintain the entry for switching off error message in FCO_COPA 006 in Transaction OBA5. By using transaction KE3I it is transportable, as is the activation of the flag “Account-based”. The generation of the characteristics into table ACDOCA should work automatically as well if transaction KE3I is used furthermore to transport the data structures– this should work rather fast in NW 7.5* and 7.60, it should take few hours in NW 7.40 (to generate the client-independent environment via transaction KEA0 this report FCO_ADD_COPA_FIELD_TO_ACDOCA in NW 7.40 is taken otherwise would run into time-outs). 3. What is the purpose of using COPA tables in SFIN? The line items are stored in ACDOCA in account based COPA. By a HANA compatibility view for reading, Table COEP is replaced and from table ACDOCA it is redirected to read data and to the COEP structure it is mapped. The line items are stored in CE1XXXX (actual) and CE2XXXX (planning) in costing based COPA where the operating concern is denoted by 'XXXX'. In CE4XXXX the PA segments are stored. 4. When trying to run realignment (KEND) in account based COPA why error message FCO_COPA058 are received? For account based COPA in SFIN the realignment functionality is not supported currently. Realignment is possible if only costing based CO-PA is active. 5. Why PA segment on the sales order is received after upgrading to SFIN ? Why after upgrading to SFIN during settlement of production order, the variances get posted to a PA segment? During upgrade to SFIN as mentioned earlier (Q1) account based CO-PA should be activated. A PA segment gets created on the sales order automatically when account based CO-PA is active. For the settlement of the production order variances a PA segment gets created automatically if in order for CO-PA to be reconciled with FI, the account based CO-PA is active. Due to PA segment account assignment if additionally the costing based CO-PA is active then to costing-based COPA the record type B gets posted during settlement in addition to the record type C.
6. Unable to generate the operating concern, after upgrading to SFIN 2.0. Why error message KE606 / FCO_COPA014 are received? In database table ACDOCA (Universal Journal Entry Line Items) at least one new unknown characteristic was added to operating concern XXXX. To activate the database table the runtime needs to be performed in the background as the runtime is very long. With transaction KEA0, the client-independent environment cannot be executed for this reason in the foreground. The step for adding new CO-PA characteristics is transferred to program FCO_ADD_COPA_FIELD_TO_ACDOCA for the database table ACDOCA. After the characteristics are added to database table ACDOCA the client-independent environment can only be fully activated without errors and without errors the database table is activated. Program FCO_ADD_COPA_FIELD_TO_ACDOCA is executed in the background for operating concern XXXX. The client-independent environment for operating concern XXXX should be generated again when the program has been executed without errors. The availability of the operating concern XXXX can be seen again. 7. Why in SFIN KEQ3 is not available? In SFIN there is no concept of segment level and non-segment level characteristics, thus, KEQ3 is no longer used. Segment level characteristics are the only characteristics. 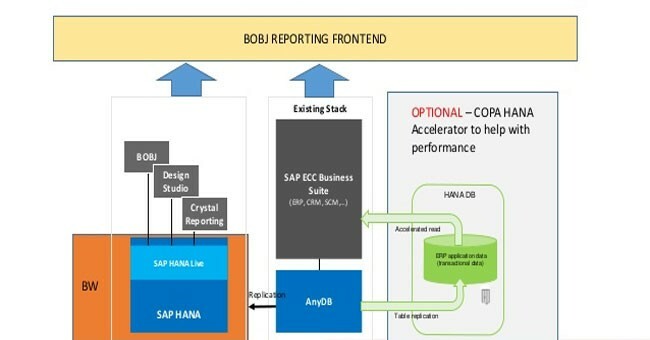 A new summarization concept comprising ACDOCA and profitability segment summarization is created with sFIN 1503 SPS 1511 and S/4 HANA 1511 OP Edition – in the IMG refer SAP 2179270 and the referenced documentation. For high volume customers like big retailers who need to handle huge data volumes, this was mainly developed. Most customers have no need for summarizing data and the default still is and shall remain. 8. Why in case of postings involving a PA segment CO document is created in SFIN? What purpose does the use of this document serve? Can the creation of CO document be deactivated? During upgrade to SFIN (refer Q1), account based CO-PA would have been activated. A CO document with account assignment to PSG will be created automatically in the releases prior to SFIN once account based COPA is active and there is posting to a PA segment. In table COEP with the document number, no entry is made in case of SFIN if there is no physical CO document. However we display the CO document as HANA compatibility view as we want to keep the compatibility with the previous releases and hence to read data it is redirected from table ACDOCA and map it to the COEP structure. Since no CO document is really created as in the past the creation of the CO document cannot be deactivated i.e. in COEP table no physical entry. In this case users get the same look and feel that they are used to in previous releases as it’s just a view from table ACDOCA. 9. When trying to change or delete operating concern SFIN Why errors are received? In S/4 Hana Financials, SAP provided SFIN operating concern as template operating concern. With sFIN 1.0 Operating concern SFIN was shipped and the structure is unchanged, as with the field catalog of this operating concern, the structure of table CE4SFIN needs to coincide. Problems may occur due to changes. In S/4 HANA Finance 1503 Operating concern SFIN furthermore shall not be used at all, as in 2042464 it has been mentioned. Therefore its data structures can only be activated from support package SPS 1508 but in transaction KEA0 it is not adapted any more. In a support package before 1508 changes unfortunately are still possible. However changes should not be made. Do not delete or change it as it is a template operating concern. 10. Some field length's in SAP S/4HANA have been increased to 40 characters. Why in CO-PA the characteristic length has not been increased? The maximum field length of the material number (MARA-MATNR) has been extended to 40 from 18 characters in SAP S/4HANA, on-premise edition 1511. The material number (ARTNR) in CO-PA is an exception as it is a fixed characteristic and with a length of 40 from S/4HANA it is the only characteristic in CO-PA, on-premise edition 1511. The maximum logical limit on length of CO-PA characteristic is 18 characters. Due to limitation of length of database table, the limit is set. On maximum number of characteristics and value fields this has dependency that can be defined in an operating concern. Therefore due to technical constraints an extension of this length for other characteristics is impossible. 11. Why on the PA segment screen the characteristic 'SEGMENT' is grayed out? To be able to report on it in SFIN characteristic to the operating concern SEGMENT was added as fixed characteristic. Directly from the profit center SEGMENT characteristic is derived and hence on the PA segment screen it cannot be changeable manually. Furthermore in the profitability segment a manual entry would only be visible but from the CO-PA account assignment screen it would not be returned to the document item to be posted (on the CO-PA account assignment screen the only fields you can enter which are transferred back are the PRCTR, FKBER and for one special case GSBER). Between FI and COPA this would result in inconsistency for an important characteristic like SEGMENT and hence for manual entry it is not open. 12. What is maximum no of characteristics available in S/4HANA Financials? Previously the limit was 50 and now the maximum no. of characteristics in an operating concern has been increased to 60 in S/4HANA Financials. 13. What about the summarization levels (tcode KEDV), Are they going to be use any longer? Since the HANA DB is very fast in retrieving data so YES summarization levels are obsolete in S/4 HANA. There is only exception is the extraction of account-based data to BW. 14. Are G/L allocations like FAGLGA15 applicable to CO-PA ? What are accredited PA segments ? G/L allocations, usually don’t post to CO-PA. For allocating costs to CO-PA you can utilize the cost center allocation via transaction KEU5. The profitability segment is written by transaction FAGLGA15, because of the reason that in S/4 HANA (Finance), the "attributed" profitability segments can be determined for specific G/L line items. Although this reason does not help in creating an account-based document, however is only able to regulate the additional attributes for the G/L line items which are written to ACDOA, which is the G/L line item table. This is all made possible through mapping all CO-PA fields of a G/L line item to their corresponding CO-PA characteristics and calling out the CO-PA derivation tool. The result is then written back to the equivalent fields of table ACDOCA. This particular logic affects all the income statement items In S/4 HANA Finance 1503 and S/4 HANA OP 1511. Right from S/4 HANA Finance 1605 and S/4 HANA OP 1610 are the only line items which are activated in customizing (IMG -> Controlling -> Profitability Analysis -> Master Data -> Activate Derivation for Items without Profitability Segment) and are the only such line items which carry a true CO account assignment and are therefore considered. No more attributing should take place from any G/L allocations, from these two releases because in G/L allocations CO account assignments are not appropriate, – except the ones listed as attributes in table ACDOCA, however this is applicable only for a true or statistical CO account assignment. 15. Why are 3 new fields (Functional Area, Segment and Cost Center) added to the CE1XXXX table, After migration to S/4 HANA Finance? The CO-PA characteristics- SEGMENT, COPA_KOSTL (cost center), and FKBER (functional area) have all been introduced as fixed CO-PA characteristics from release S/4 Hana Finance 1503 (sFIN 2.0). Therefore all these are a part of the Operating Concern data structure and have been added to the CO-PA tables. If the values have been populated in the coding block (COBL) by the source application, these characteristics are all fixed characteristics, are all automatically filled. 16. In an Intercompany sales order, how is the customer derived? The plant & sales org belong to separate different company codes, in an inter-company sales order/contract. The segment number of the sales order item come with the internal view (with the supplying company code) and due to this, it gets a different customer from SD instead of the incoming sales order line item in CO-PA which portray the external view (With the selling company code) and hence from the sales order it gets sold-to party as customer value. 17. On the PA segment, why are few characteristics grayed out? The present system design is in such a manner that field values which have been taken over via TKEZU table into CO-PA are grayed out on the profitability segment screen (even in case of initial value), and this done to ensure uniformity between SD data and segment number. Please refer SAP Document 638097 is a workaround to modify this behavior (by clearing the INPUT flag for allowing manual entries). 18. During retraction of data into COPA (tcode KELR), Is valuation possible? Yes, validation is possible incase you are retracting plan data the program to be processed is ZXKKEU04. For actual data retraction use program ZXKKEU03. 19. When running a report in KE30 using ABC Analysis, why is message no. KH-631 displayed? Incase, positive and negatives values are present in a column, then and analysis of ABC is not possible and the error KH-681 will be displayed. The ABC analysis is only meant for positive values. Upon selecting the column which contains only positive values, then ABC analysis can be executed. A call to the ABC analysis for values with negative and positive values cannot be evaluated in the ABC analysis. 20. Can the default "PA transfer structure FI" for direct FI/MM Postings be changed to a different structure? No, the default structure for Direct FI/MM posting cannot be changed as it is hardcoded in the system to refer to the PA transfer structure FI for record type B posting in CO-PA. You will end up with the KF018 error during record type B (FI/MM postings), Incase you do not have the Cost Element mapped in the PA transfer structure. 21. How is the posting date resolute in CO-PA for a record type F document? 22. How can you make entries in the generated check tables T25NN for avoiding error KE0C133? By using t-code KES1, you can populate the generated check tables T25NN. 23. Is KE4MS called during planning? As listed in the SAP Document 842127 KE21S: Calling module COPA_UPDATE_STANDARD_MEASURES in plan" in case of actual data, KE4MS is only called for valuation. To have the same functionality as KE4MS in planning the only option is to use user exit COPA0002. 24. What dos this mean: You receive the information message 'SQL error: 443' in KEDU? 'SQL error: 443-' This is an information message which is at times raised immediately after starting a job in transaction KEDU . These information messages are forced by note 407312 (which is part of your SP) and can be left ignored as long as RKETRERU can create the summarization levels with status 'Active'. 25. How to add a new characteristic? What database tables are affected? For adding new characteristic please check the documentation of CO-PA customizing in transaction ORKE: -> Structures -> Define Operating Concern -> Maintain Characteristics. When a user add some new characterstics then a new field (column) also gets added to CO-PA tables. Now if the costing is based on COPA then the tables would be CE1XXXX, CE2XXXX, CE3XXXX, CE4XXXX, CE4XXXX_ACCT, CE4XXXX_KENC and CE4XXXX_FLAG (XXXX = operating concern). If only classical account based is active then the tables would be CE4XXXX, CE4XXXX_ACCT, CE4XXXX_KENC and CE4XXXX_FLAG (XXXX = operating concern). If the account based COPA in S/4 HANA besides the above then the table ACDOCA is also affected. If only the combined CO-PA tables CE9XXXX_KENC and CE9XXXX_H gets affected alongwith the tables of costing based CO-PA.